Just two days after performing at Tacoma, Washington on Saturday, Joan stopped by Scriber Lake Alternative High School in Edmonds, Washington, to speak to the students about getting her GED. EDMONDS, Wash. — Need a way to get students to listen at school? How about inviting a rock star. That’s exactly what happened at Scriber Lake Alternative High School in Edmonds. The school, which enrolls students who are at risk of dropping out or have learning disabilities, hosted Joan Jett Monday afternoon. “I said, ‘This person has a vision that I want my kids to see,'” said Gary Lange, English teacher at Scriber Lake. On a chance, Lange sent emails to Jett’s longtime manager Kenny Laguna. To Lange’s surprise, he got a response, and then confirmation that Jett wanted to visit the school. Jett spoke to the student body of about 200 teens in the schools gymnasium. Her visit lasted about an hour, first starting with a brief background of how she started, then trailing into a question and answer from the students. Jett worked the crowd, often times asking students to speak up because she called herself a “deaf rock star.” She also gave out hugs on request and accepted students artwork drawn especially for her. Her visit was a hit with students. Click HERE for the rest of the article, including more quotes from Joan, more pics, and a VIDEO of the newscast. Follow the jump for other articles about of her visit. GREAT STUFF. Jett’s visit to the Scriber Lake, the only alternative high school in the Edmonds School District, was arranged by teacher Greg Lange. He said he saw The Runaways, a 2010 movie based on Jett and her first band starring Kristen Stewart, and realized Jett’s early life was similar to that of many of his students. Scriber Lake students had been studying rock ‘n’ roll and Jett in particular for the past few weeks. Jett connected with her young audience when describing her introduction, as a teenager, to music as a member of an all-girl band. She teared up when recalling how some music critics savaged her, but kept on thanks to the support of her fans. “There were struggles, and times when I was not in the best of shape.” But her determination and the support of Laguna, who helped form Joan Jett and the Blackhearts, kept her going. Musician Joan Jett rocked the house during an assembly at Scriber Lake High School Monday afternoon, but not with her music. She just talked. Not as an adult swooping in with lofty plans to educate the students, but as a fellow human being just trying to be herself rather than conform to someone else’s ideas and plans. And she had them eating out of her hand. … A kid who didn’t fit in during her teenage years, Jett was teased and picked on by others, just like many of the students at Edmonds’ alternative high school. But she perservered, seeing her differences as strengths, and went on to become a bona fide rock star – and one of only two women named to Rolling Stone’s list of the 100 greatest guitarists of all time. Jett encouraged the students not to worry about societal norms, but to follow their hearts. “Find something you love” and go for it, she said. “Don’t be afraid! At least if you try, you tried!” And even if you don’t reach your goal, “you’ll survive and you’ll be a stronger person.” Then find something else and try again. The students, of course, cheered wildly at this. Several also asked for hugs and gave her their artwork during the question-and-answer session. They were clearly moved by this rock star who was, really, just like one of them. …[Joan] and Blackheart Records partner Kenny Laguna stayed for hours at an assembly and then after school to field questions (“How much do you like rock and roll?” one student asked), mingle and accept artwork from some of the students. She was invited to speak before the school by Scriber Lake teacher Greg Lange, who works with kids at risk of dropping out. He wrote to Jett after he watched the 2010 film, “The Runaways.” In the film, Jett is portrayed as a young woman with a vision which she wouldn’t let die, Lange said. “Thirty five years ago, she easily could’ve sat in my classroom,” he said. Scriber Lake student Abby Boese, 16, said everyone knows Jett’s music. Despite her fame, Jett could probably understand this generation of youth. “She really can relate to us,” Abby said. At the assembly, Jett and Laguna encouraged the students to earn their high school diplomas and find something they love to do. Laguna advised students to set attainable goals, such as aiming to make a living off what they like to do. If they love music, they could become a music teacher rather than aim to become Elvis. “Set your goals at a place that’s reasonable,” he said. Her rebellion was never about school or her parents, Jett said. She encouraged students to try what may be difficult because even if they fail it’ll make them stronger. “It was about keeping your desire to do it and finding someone who understands you, Kenny is that for me. He believed in me,” Jett said. This entry was posted in Personal Appearances and tagged Edmonds Washington, Joan Jett, Scriber Lake Alternative High School. Bookmark the permalink. 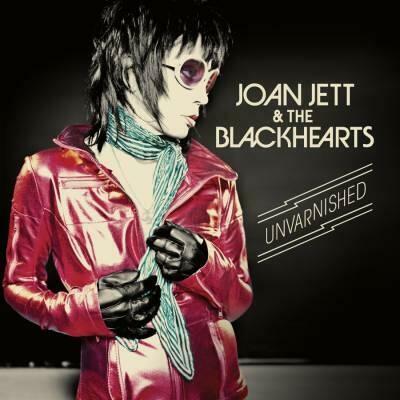 New Joan Jett tour dates in Canada! Your welcome, Greg! Thanks for taking the time to stop by and say Hi. Your school sounds like an awesome place, and your awesome students have excellent taste! 😀 Thank you all for helping us spread the word of Joan. This website is FANTASTIC!!!!!! I love it!! !